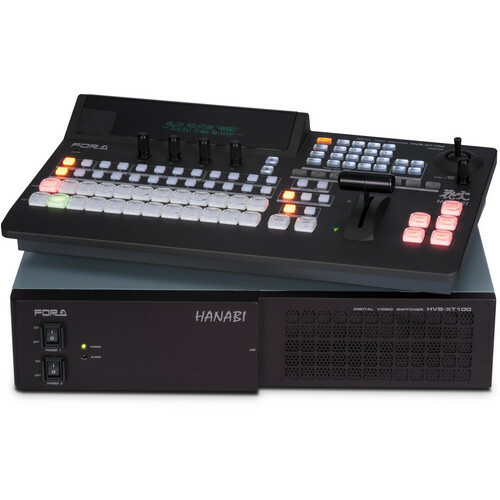 The HVS-100 HD/SD Portable Video Switcher with HVS-100OU Control Panel from For.A is a multi-functional unit that incorporates a range of functions and features including mixed HD/SD input, frame synchronizing, re-sizing engine, 2.5D wipe effects, DVE, keyer with chroma key, and DSK. It features 8 SD/HD-SDI inputs, 4 SD/HD-SDI outputs, and 1 HDMI outputs. It also has three slots open for various inputs and outputs to be added, such as analog, component, analog composite, HDMI, and VGA, in addition to more SD/HD-SDI. This switcher also includes a built-in Web server that lets you change settings from a PC or tablet terminal. A clip memory feature has been added to this unit to support elaborate performances such as through the use of CG wipes, while the multi-viewer meets a diverse range of monitoring needs. This portable video switcher unit features a single main unit and control panel. The equipment can be used in all types of locations, including live events, sports, news studios, broadcasting vans, editorial offices, and presentation halls, making it a suitable tool for shaping the imaginative ideas of video creators. The control panel has been specifically designed keeping professionals in mind. It includes authentic bus buttons, AUX buttons, a fader controller, and direct buttons for various functions with one touch. The main unit offers expandability to facilitate the add-on of a redundant power source unit and various input/output cards. 8 inputs and 4 outputs come as standard with HD/SD-SDI. It supports mixed HD/SD input in standard configuration. The 5 outputs, including an HDMI output, can be freely assigned. It also features 3 slots that enable various inputs and outputs to be added, such as analog component, analog composite, HDMI, and VGA in addition to HD/SD-SDI. Each input in this unit is fitted with a frame synchronizer that enables switching of asynchronous video signals. Installation of expansion cards (sold separately) supports asynchronous picture input from PCs, etc. Each input is also equipped with a process amplifier capable of adjusting the video level, chroma level, etc. of the input signal. A re-sizing engine (expansion) is provided on 4 of the inputs. This achieves a fully mixed SD/HD environment with a switcher alone and no need to connect any external equipment such as an up-converter. This is readily suitable for re-sizing not only SD signals but also PC video. The keyer has a chroma key function. Since the keyer and DSK each have free-assignable 2.5D DVE, scale effects (expansion, contraction) or other effects of the synthesized channel can be set individually. Video signals and PGM output can be captured as still images. You can achieve a CG wipe using data sent via Ethernet such as still data created on a PC or up to 480-frame video. Images can be uploaded and downloaded using the USB port. The still stores support JPEG, TGA, and BMP file formats. A backup function means still image data can be stored in the main unit and retrieved after rebooting. Display channels can be freely assigned, allowing assignment of not only input source but also PGM output. Output from HDMI is also possible without compromising the resolution of SD video and the image is displayed in the split view. Each channel offers title display and tally display functions. The main unit is equipped with an event memory function allowing 100 events to be stored. It is possible to register events on a user button on the control panel and remote panel so that panel settings can be changed simply by pushing the user button. You can freely set the transition time and effect for loading events. Since seamless transition of complex images to the recorded state is possible with a single button, it is suitable for live applications. You can freely register various switcher functions on the user button to customize the control panel in line with needs. External interfaces include the EDITOR port for connecting to an editor, GPI port supporting up to 24 inputs/outputs, RS-422 port for connecting an HVS-30RU Remote Control Panel (sold separately), and an Ethernet port used during PC control. A built-in Web server enables the settings of this switcher to be changed from a PC via a network. Mobile and tablet terminals can also be used through a wireless access point. The redundant power supply unit (sold separately) enables doubling-up of power source. An enlarged fan and improved exhaust process guarantee silent operation, making it suitable for installation near the control panel or in quiet environments. Note: Optional expansion card is required to support 1080/59.94p and 1080/50p. Box Dimensions (LxWxH) 21.9 x 17.8 x 7.9"
HVS-100 HD/SD Portable Video Switcher with HVS-100OU Control Panel is rated 4.0 out of 5 by 1. Rated 4 out of 5 by Calling the Shots from Worth the wait... Lead time for order and shipping is about 10 weeks! But this production switcher is well worth the wait! Rock solid device with lots of menu features. Don't forget any accessory cards, which can come in handy for adapting to a wide range of input/output signals. Thanks B&H for your great customer service! Can a custom transition/wipe be used on the switcher? Yes, you can create a custom effect. Use the switcher GUI and the toggle. The DB25 GPI conector is not for tally too? if yes, how many tallys and how many GPI out and GPI in? This switcher has a GPI-IN/OUT, which is a single 25-pin D-sub female connection. It supports 24 inputs and 24 outputs through that connection. is this switcher capable of internally recording all cameras feeds raw in addition to the switcher feed? Sorry, no, this switcher cannot internally record. what is the pin configuration for the tally light? The tally light configuration is RS-422: 9-pin D-sub (female).